Invacare I-Class Dual Release Adult Paddle Walker With Wheels has a wide, deep frame for user convenience and is lightweight, making it easy to lift and maneuver. The paddle release mechanism makes folding the walker easy and is ideal for users with dexterity issues. Its unique folding mechanism consists of ergonomic, nylon paddles which resist cracking or shattering and are easy to reach from a seated position. 1. Swing both side frames out away from the front crossbrace until an audible "click" is heard and both locking mechanisms engage. 2. Test the walker by grasping the side frames and, with some force, try to fold them inward. 3. To fold the walker, press down on the locking mechanisms and fold the side frames in toward the front crossbrace. 1. Press the snap button and slide the leg extension onto the walker leg. 2. Adjust the leg extension to the desired height and allow the snap button to snap into the height adjustment hole. 4. Make sure that the walker is level. 1. Regular cleaning of the walker is recommended. Wipe all surfaces with a damp cloth and allow all surfaces to dry before use. 2. Regular inspection of parts including hardware, brackets, and plastics, for deformation, corrosion, breakage, wear or compression is recommended. Replace the walker if any of these conditions exist. 3. Ensure the handgrips do not twist on side frame. The handgrips must be tight. Do not use the walker if the handgrips are loose. 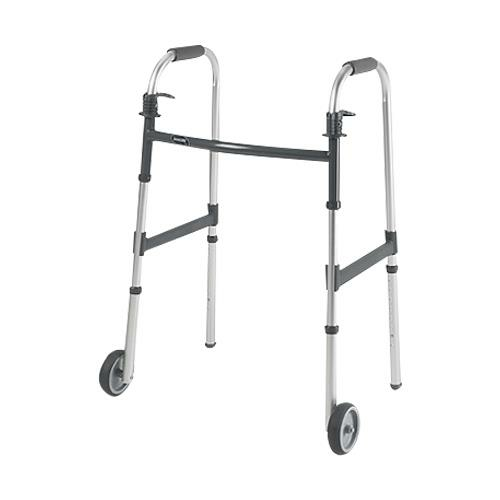 Replace the walker if the handgrips are loose on the side frame. 4. If rubber tips are worn or cracked, replace the rubber tips immediately. Height Adjustment 33" to 39"
5ft 6" to 6ft 6"
Is this the adult walker with 5 inch wheels from invacare? Thanks gor contacting customer care service. Please refer Specification table on our product page.